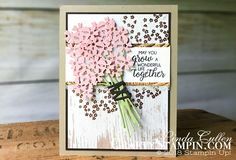 A stunning, yet simple card featuring the Stampin’ Up! By The Bay Stamp Set that you can earn for FREE with a $50 purchase during Sale-a-bration. The beautiful sunset is created by sponging inks over a masked stamped image. 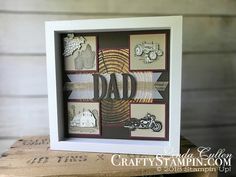 You can use the Sponge Brayer, Stampin’ Sponges or Sponge Daubers, just depends on the size of the area you wish to color. The background is the Pinewood Planks Dynamic Texture Impressions Embossing Folder. This is a stunning card. I really wasn’t taken by this stamp set until seeing this card. Great job, Linda.